1 'Comfortable' is, of course, a relative term. One may well understand standard notation without being able to read it easily. Tablature is sufficiently intuitive that most players can pick it up right away. 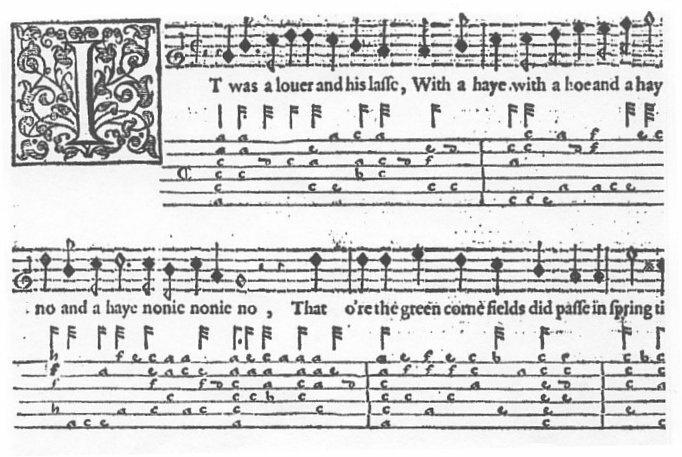 2 The side and bottom border for this page is taken from tablature for the five-coursed (five pairs of sympathetic strings) vihuela, in the mid 16th century. Because of its lack of portability to other instruments it is usually disparaged by musicians experienced with standard notation, who often assume it is a fairly new development designed to aid those unwilling to put the time into reading 'real' music. It is actually quite old; it was first developed for the organ in the medieval period and was a standard method for notating fretted instruments prior2 to and during the baroque period. Morley, It was a lover and his lass Published by Thomas Morley in London, 1600. 3 Well, the time notations are sort of standard. A group of similar notes (e.g. all sixteenths) are often just indicated by the stem on the first note in the series. The first two notes are obviously eighths; then there is a dotted quarter followed by another eighth and a quarter. The notes in the second measure look the same as the quarters, but clearly this is in ⁴ time, so they must be half notes. The third measure is a problem though. It obviously contains two quarters and a half, but it is not possible to decide in what order they are supposed to come. Now, what is intended in the third measure is clear, and it has the advantage of being readable both by people who prefer standard notation and by those who prefer tab. Once again, several things present themselves immediately. The most obvious is that there are no stems. There is, in fact no way at all to tell what sort of timing these notes are supposed to have. You are expected to have access to the audio recording to figure that stuff out on your own. The addition of the chords at the top is useful, as is the clearly defined tuning base, but the other thing you may or may not have noticed is that it is wrong. Not just that measure lines are missing (the author may have heard this as eighth notes after all), but the first two notes are also incorrect (admittedly, this is what she plays through the rest of the piece). The only reason I point this out is to alert you that such resources, while they are often useful, need to be verified with your own ears. 4 I suppose you could address this by doing something like |2|, but I do not expect that to catch on either. But I have never seen anyone do this. It is hard to read, and, of course, you still have the ambiguity in the last measure that is inherent in tab.4 If you have software that is capable of doing both standard and tab, the best approach is to do it as I have done with Adrian above, take a screen shot or make a PDF, and post it that way. We will next take a brief excursion into the world of available software.